Three-year-old Chingfong* is one of these children. Chingfong’s parents work full time in Cambodia’s capital of Phnom Penh. Because their hometown of Battambang offers limited professional opportunities, her parents took jobs in Phnom Penh, her father working with a large private company and her mother at a finance firm. Like many Cambodian parents, they left Chingfong with grandparents in Battambang, 390 kilometers away, rather than leave her in daycare with strangers. Her parents visited during weekends and long holidays. On the recommendation of friends, the parents decided to meet with specialists in Phnom Penh. 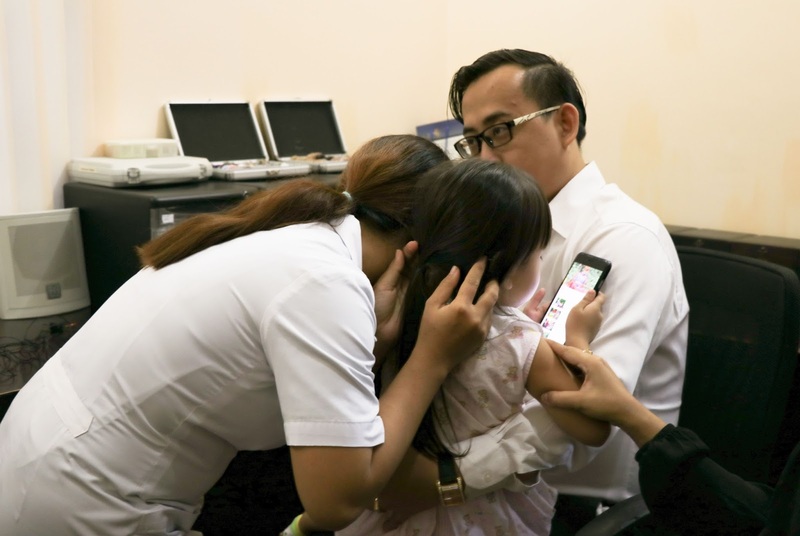 At the Center for Child and Adolescent Mental Health, Cambodia’s only mental health facility dedicated to diagnosing and treating developmentally delayed children, staff suspected that Chingfong had an issue with her hearing, not autism. They referred her to All Ears Cambodia, a local UNICEF-supported NGO that provides auditory rehabilitation services to children with hearing impairments. All Ears Cambodia is a partner with UNICEF under the Disability Rights Initiative, which seeks to reduce barriers to participation of children and persons with disabilities in Cambodia. Persons with disabilities are often marginalized from Cambodian society and little to no support exists for children. With support from the Government of Australia, UNICEF and All Ears are addressing the needs of children with hearing impairments and raising awareness about the importance of early identification of hearing-related impairments and proper ear health practices. 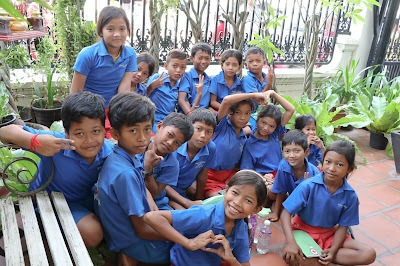 All Ears treats individual cases like Chingfong’s and also conducts regular check ups for underserved children, including those assisted by organizations like KUMAR (vulnerable children) and Damnoek Toeuk (children with disabilities). Staff at All Ears Cambodia began by testing Chingfong’s ears. Like a typical two-year-old facing an unfamiliar experience, she resisted the tests. But her parents and the doctor did not give up, employing various methods until finally, after three months, Chingfong had the confidence to participate. The first diagnosis revealed her eardrum wasn’t functioning properly. Chingfong had been unable to hear since she was born. Finally, her parents understood what had been preventing their daughter from developing like others. Chingfong has been wearing the hearing aid for more than half a year and is now able to communicate with her parents and friends. She can read and write on her own and enjoys being in kindergarten. “The first time she called me Daddy, I was very happy,” the father says. “I just hadn’t realized she couldn’t speak because she couldn’t hear.” The girl now lives with her parents in Phnom Penh so the family can access the support and services their daughter needs. Chingfong goes to All Ears monthly to follow up on her hearing improvement. “I’m thankful she has access to this technology. Without it, she may have become farther and farther removed from the outside world,” he observes. This relieved father hopes that services like those offered by All Ears Cambodia will one day be offered to Cambodian children across the nation, ensuring all young Cambodians stay connected to the world and receive the education they deserve. All Ears Cambodia provides a unique medical service from newborn to the elderly: helping them to hear. The services include ear health care, audiology services, and treatment of ear diseases, using advanced examination and therapeutic techniques. The AEC clinic in Phnom Penh is open every weekday. AEC also has outreach projects, currently operating in eight provinces: Kampong Chhnang, Pursat, Kampot, Kandal, Siem Reap, Battambang, Kep and Preah Sihanouk. The clinics provide services to local people and marginalized groups such as children and adults from the poorest households, including internal refugees, children with disabilities, street children and drug addicts. *Name changed to protect a child’s identity as requested by the parents.